Nine months can feel like a long time to wait for baby’s arrival. Thanks to the continued rise of awesome pregnancy apps, however, you can now gain a window into the world of your growing bump and what's happening in there. There are lots of pregnancy apps to choose from, with most offering common features such as baby growth visualisers and digital journals for you to tap in notes on your pregnancy. Some pregnancy apps focus more on keeping you well and fit, while others help you plan for labour or time your contractions. From the makers of the best-selling pregnancy book What To Expect When You’re Expecting, this free app contains a bumper-load of information about pregnancy and what happens during each trimester. Upload your pregnancy info to calculate your due date, view weekly videos about how your body is changing, plus weekly illustrations of baby’s development. A wealth of pregnancy tips keep you informed about your pregnancy, with advice on how to plan for baby's arrival – from buying newborn clothes to choosing babies bottles. Social types can swap pregnancy stories, advice and emotional support with other mamas-to-be via the app’s global community feature. One of the most downloaded pregnancy apps in the world, racking up over 100,000 5-star reviews. Full disclosure: if you want to continue using this app beyond week 14 of your pregnancy, it will cost you £2.99. Pregnancy+ has a neat customisation factor in that it can be personalised for use by you or your partner, or other family members or friends. The app displays daily information about your growing pregnancy, and has sections where you can add notes about doctor’s visits or create an in-depth pregnancy diary and weight log. There’s also a kick counter and, for when baby’s on the way, a contraction timer. Positioning itself as ‘the number one app for first-time moms’, The Bump is massively popular for its week-by-week pregnancy guide, comparing the size of your baby to an illustration of a fruit – so cute! There’s also an interactive, 3D visualisation of baby’s growth in the womb. The Bump is more of a ‘pregnancy destination’ than just a tracker app, giving you access to experts, not to mention other mums, who can answer pregnancy questions. It has a decent planner for keeping track of your scans, check-ups and GP appointments, plus an updated catalogue of popular baby essentials and clothing to buy online. 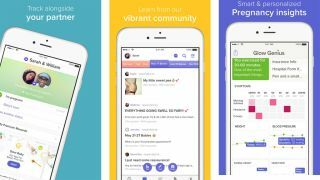 Crowned as one of Time magazine’s Top 50 Apps of 2016, Sprout Pregnancy has a ton of tools to help you understand your pregnancy. Like Pregnancy+ this app has a free trial period (two weeks) and charges £3.99 for the full version; you can continue with a ‘lite’ version but many of the app’s features will disappear. Via the full-fat app you can view an interactive 3D illustration of your baby’s development, with information on its weekly size, weight and behaviour. Among other features there’s a personalised pregnancy timeline, health practitioner advice, an organiser, kick counter and a comprehensive My Journal tab for adding images and notes – great for jotting down any issues you’d like to speak to your midwife about. Kegel exercises are a must for all women, especially those of you who are pregnant. Thankfully the Glow Nurture app has a built-in kegel exercises reminder, as well as a Daily Tasks feature suggesting different ways to boost your health and baby’s. There’s integration with Jawbone fitness trackers, MyFitnessPal and Apple Health, and access to medical features such as postpartum support. Glow Nurture also has a symptom tracker and a trimester-specific tracker, offers feedback on your personal pregnancy health, and, of course, provides updates on baby’s size and progress. The basic app is free, and for £7.99 a month the Glow Premium subscription brings extra features including exclusive articles, private messaging and VIP support. Helps you hear baby’s heartbeat! Listen to the sound of your baby’s heartbeat with this prenatal listener. Available for iPhone and iPad users, the My Baby’s Beat app (£1.99) is a novel way to help you and your partner bond with baby while they’re in the womb. Via the app you can listen to and record the sound of your baby’s heartbeat. Then, if you wish, share it with friends and family via email, text, What’sApp or even Twitter and Facebook! The app users the iPhone or iPad’s built-in microphone to pick-up the sound of baby’s heartbeat for you to listen aloud or on headphones. Do you enjoy crafting? How about digital crafting? If so, this one’s for you! Baby Pics is a stylish app that enables you to capture your pregnancy (and baby) milestones with beautifully presented digital artwork and personalised text. Take images of your bump growth, your first scan, or the day of baby’s first kick and upload them to Baby Pics, where you can annotate them and add imagery and digital stickers. Once done, each picture will be available for downloading or sharing via email, messaging or social media. The basic version of Baby Pics costs £2.99, with add-ons and sticker packs available, at extra cost, in-app. Getting quality sleep is an issue during pregnancy, and finding the time and mental clarity to properly relax can be difficult. Sound machines and apps can be effective at helping us to relax enough for sleep, and Noisli (£1.49 for Android users, £1.99 for iPhone users) is one of the more popular white noise and sound machine apps. It has an offline soundboard of various white noise and ambient soundscapes that you can blend together to create a personalised soundtrack for relaxation or sleep. There are pre-mixed sounds available, too, and a handy timer and fade out function. Choosing the right name for baby can be overwhelming, but help is here... With over one million downloads and counting, the Baby Names app has helped countless parents find the perfect moniker for their child. There are more than 30,000 names stuffed inside this free app – sort them by meaning, gender, origin or popularity, then create a favourites list to help you decide. While the £1.25 premium version has a Genie that will suggest baby names to match your’s and your partner’s, the free version has more than enough names inspiration.